San Jose police found their stolen patrol car and arrested the man accused of taking it, but how he managed to steal three vehicles and shed his handcuffs remains a mystery. SAN JOSE, Calif. (KGO) -- San Jose police found their stolen patrol car and arrested the man accused of taking it, but how he managed to steal three vehicles and shed his handcuffs remains a mystery Tuesday night. The stolen patrol car was found at an industrial park on Clawiter Road in Hayward some 25 miles north of where it was taken. Nearby business owner, Laurie Murdock of Target Glass, described what her employee saw. "He saw what I now know is the stolen police car pull into a parking space and work hard to tuck itself in get out and run up the driveway this way," said Murdock. 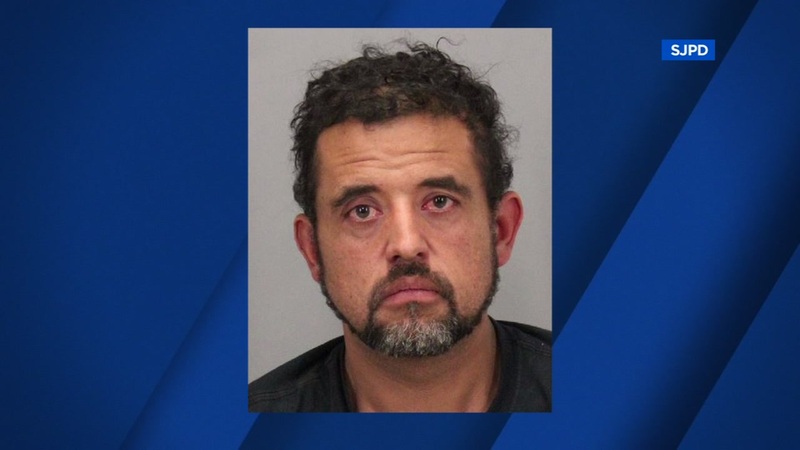 The spree started early Tuesday morning when police say they arrested 40-year-old Andrew Trujillo in a stolen semi-truck at Holger Way in North San Jose. Police say while in the officer's patrol car Trujillo managed to slip his cuffs from behind his back, then get out of the rear seat and into the driver's seat. He sped-off ditched the patrol car in Hayward. There was a third scene at the intersection of Smalley Avenue and Mission Boulevard. The day long search came to a head in the doorway of an auto parts store where Trujillo had stopped to tell his dad he was OK.
"We had developed investigative information that he was still in the area so we saturated the area with police officers," said Sgt. Enrique Garcia, San Jose Police Department. "It looked like a SWAT team almost that was out here," said Dale Dameral, owner of nearby King Kustom Kovers. Trujillo's father declined to go on camera, but said the police K-9 latched onto his son's stomach during the arrest. "When I went back over to my shop they had the ambulance come out. I guess he got bit pretty good," said Dameral. Police say they'd watched Trujillo pull-up in yet another stolen truck. "He was smart enough to change his clothing and obviously he managed to somehow get rid of his handcuffs. We don't know where the handcuffs are at now," said Sgt. Garcia. Trujillo was first arrested wearing a Campbells Towing shirt. He is not an employee and the tow company says they had a truck stolen recently. San Jose Police are now digging into Trujillo's record.